These are the top seven yoga centres in the city that are guaranteed to please the yogi within. Your first introduction to Om Studio will be through Rinul Pashankar, one of the core team members of this establishment. Her interest in adventure and yoga encourages her to be a part of the fitness community through Om Studio. You can opt for aerial or power yoga, depending on your need and interest. Also, do not worry about being an amateur, you can walk in knowing nothing about yoga. The team guarantees to make this a fun learning experience. Om Studio also conducts classes for dance, martial arts, healing, music and other inspiring art forms. Om Studio is located on J.M Road. This chain of gyms owner by Samir Kapoor and Sally Jones took over Pune by storm last year, and even made its way to Gurgaon and Mumbai! MultiFit has been popular for its functional training courses and crossfit training, but not many know of the yoga classes that are conducted in the Kalyani Nagar branch of the gym. Students, the crème de la crème of Pune, are taught the nuances of yoga under the guidance of Mahdi Golara, yoga and military training expert. You can opt for a free session too before you sign up. Once you sign up, you will be taken through your personalized time-table. Located in Baner,UrBounce is a unique fitness destination spread over 10,800 sq ft and is suitable for all ages. Students train under Melika Nemati, a yoga expert with more than 5 years of experience in practising various forms of yoga. You can opt for a yoga session with a group, or sign up for an individual class too. This fitness studio also gives you an option to sign up for a nutrition consultation along with a personalised training timetable. 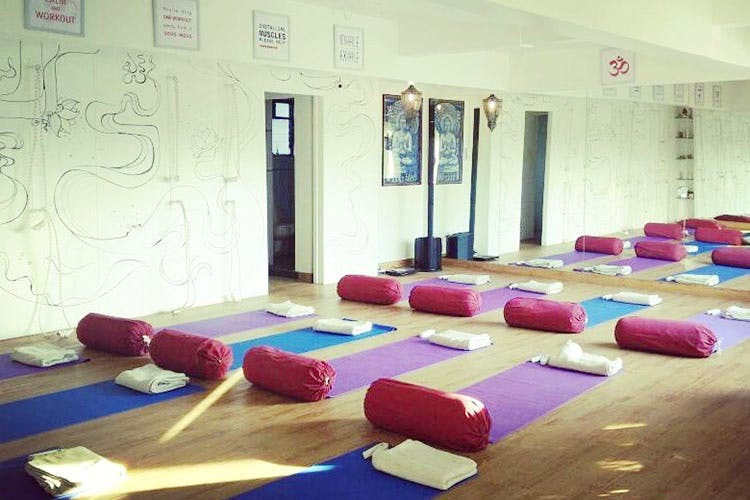 The reviews tell us that all the students here love their instructors, and thoroughly enjoy the interactive classes at this Kalyani Nagar yoga studio. Zahabiya, the owner of Y’Phoria Yoga is also known as one of the best yoga instructors in the city of Pune. One can practice Hatha Yoga, Vinyasa Flow and Power Yoga and these classes are suitable for people of all ages. Originally a dance studio, The Feet Circus also conducts yoga classes. Keeping in mind their aim of making fitness fun, Priyanka Kiraf makes sure her students have a great time at her classes. A vibrant ambience and a warm, welcoming team make this yoga studio a favourite amongst many. The Feet Circus also conducts workshops and events for kids. The Feet Circus is a little more than a year old, and is located in Koregaon Park.